What is a good moveset for Durant? Monotype: Steel- "The Premier Scarfer"
With an above average Base 109 Atk further buffed by it's Hustle Ability and a Speed Stat that allows it to outpace Terrakion by exactly 1 Point, the Iron Ant Pokemon can be considered to be the best Scarfer Mono Steel Teams have to offer. 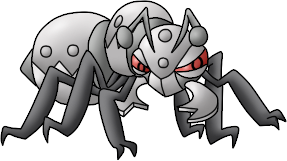 Perhaps one of the most underrated Pokemon in the Monotype Sub-Metagame, Durant's combination of Physical might, oddly high Speed, sufficient Coverage Moves, and Baton Pass make the Iron Ant Pokemon Mono Steel's "Primier Scarfer", outclassing it's Competition in Lucario in terms of Speed and Jirachi in terms of Power. Given all the Coverage Move's it needs, it's STAB Attack in Iron Head synergizes well with the typical Paralysis-Based Mono Steel Teams, while Rock Slide eliminates the Fire Type that threaten it. In addition to that, BW2 also blessed it with yet another odd perk: Superpower, a Move that breaks down the Steels and Water/Ground Type that resist it's Steel/Rock Coverage. To top it off, it also follows the Generation V pattern of granting Bug Type's Baton Pass, so, like Scolipede, it also capable of using the pseudo-Pivot Move to Scout out the opponents next Move, functioning much like a U-turn or Volt Switch but with the absence of Damage or, being blocked by an Immunity. The Jolly Natured (+Spd, -SAtk) gives it the Speed to outpace even Terrakion, killing it off with a 252 Atk+Hustle Iron Head. The Choice Scarf of course Boost it's Speed to beat other Scarfers that threaten Mono Steel (Terrakion). Overall, Durant has proved to be the best Scarfer of Mono Steel due to the above advantages. You don't need baton pass, just switch out. Does it have truant as ability then? Why bringing this back up? Tbh hone claws on Durant isn't quite that good for Durant can easily get OHKOed by a fire type move. Well then again you could do a focus sash. How does Durant learn hone claws? Entrainment DOES work with Truant and is the devastating part of this set. Iron-head is for STAB, and Flinch. X-scissor is STAB. Stone-edge is coverage and T-wave is for if you really want to be annoying. Using this set may do the following: Make people swear at you, stop being friends with you, hate you, and want to murder you. Note I will never use this set as it is too annoying and mean. In fact, it does ^^. Just tested it. ... you really are a savage. THIS IS BRILLIANT XD. WELL I DID MAKE SOMEONE CALL ME A SWEAR WORD BUT WHO CARES? As you can imagine, adamant Durant cleanly OHKOes all of these threats except for Mega Aggron ( again, no Mega Aggrons run max defense). Have fun with the tier demolisher! Can I use this pls? this is a public forum. of course! This is how its done basically. Life Orb is power so I can use jolly to amp his speed up. Then Hone claws makes up for hustles' accuracy drop. Then he simply Life Orb sweeps away..
Alright, alright, this has been posted a bunch of times, simply because this is the best set Durant can muster. Hone Claws boosts Attack so that the monsterous Hustle boost can be even more dangerous, while also boosting Accuracy which patches up the accuracy drop that Hustle provides. Iron Head is a great STAB, dealing with Fairy-types and what not. Stone Edge deals with Fire-types that have super-effective moves that otherwise would nuke Durant, while Superpower can be used to get rid of opposing Steel-types which otherwise wall Durant. X-Scissor is Durant's best Bug-type STAB, and it deals with Grass-types. Life Orb can be used to have amazing power, while Focus Sash can be used to ensure that Durant can get off at least 1 Hone Claws boost. It's a very perfect Durant set I came up with. You put a focus sash on Durant to guarantee a Hone Claws set up ( Note that Hone Claws not only boosts Durant's already amazing attack stat from the hustle ability, but also patches Hustle's accuracy loss). Focus sash is very crucial because any fire attack WILL kill in one hit (Hope you don't get an unlucky burn). Once Hone claws is set up, go to town on your opponent. With 348 speed at level 100, you're likely to outspeed most Pokemon. Now if you send your Durant out and you know a Pokemon is faster than you, go for an attack instead, rather than hone clawing ( You'll still do a great amount of damage). EXAMPLE: If a Darmanitan is on the field, go for Rock Slide, or Stone Edge to take it out after it hits you. Same goes for Talonflame. Overall this Pokemon has great coverage. Against 9 types, Bug, Psychic, Dark, Fairy, Rock, Grass, Fire, Ice, and Flying. I have used this Durant set in many OU battles and it works well. It says it all right here. "I'm gonna eat the **** out of your flesh!!" And why is this flagged? Trachy's Answer was also flagged, and both him and I were swearing in our answers, I think that's why. I edited out the swearing in both answers. dark type move with a 20% chance to flinch target / Stone edge would have 85.12 accuracy and it is a 100 power move. X-Scissor it a 80 power Stab bug type move. Jolly Nature because my set does not not have a Choice Scarf so it needs to be fast enough to be able to outspeed other Pokemon giving it base 348 speed. Hustle was the best option for a ability it boosts attack by 1.5 but it did lower accuracy to 80%. Basic 80 Power 100% accuracy sweeper. Durant overall is a beast with high as speed. One of my fave Pokemon! Crunch or a different move for my Durant? Durant or Klinklang for my new RU team? Is there a reason for Durant having Truant? Competitive use for heatmor, durant, dewgong, yanmega, mr.mime? What move did the Durant use? What IVs does my Durant have? Is Durant a sweeper or a tank? Is this hacked Durant egg dangerous?